Judge Lawrence first joined the Court as a Magistrate Judge in November 2002. President George W. Bush, with the confirmation of the Senate, elevated Judge Lawrence to the position of District Judge on June 30, 2008, making him the first Magistrate Judge in the Southern District to become a District Judge. 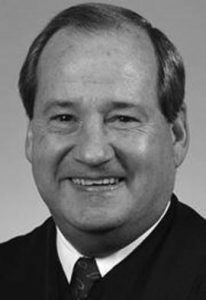 He filled the vacancy created by Judge John Daniel Tinder’s elevation to the United States Court of Appeals for the Seventh Circuit. Prior to being a Magistrate Judge, Judge Lawrence was the elected Judge of the Marion County Circuit Court from 1996 to 2002, after serving as a Master Commissioner there for over 13 years. He served as a major felony Public Defender in the Marion County Criminal Court for nine years. In 1980, Judge Lawrence was appointed Executive Director of Indiana’s first Merit Selection Commission on Federal Judicial Appointments by Senator Richard Lugar.